We (Lisa & Sara) have been friends since our early newlywed days (circa 2001) where we co-founded (or attempted to) a social group/dinner club called “MASK,” Married and Still Kool….not surprisingly, the 2 of us and our husbands were the only ones that caught the vision and joined! Those other couples seriously missed out! So began our friendship solidified by nights of the 4 of us playing tennis, spades, eating DiGiorno pizzas and watching the first season of Survivor religiously from the Moffitt’s little (now shady!) apartment. We were instant friends and quickly discovered our love for Jesus, decorating, creating and all things artsy. We even bonded over 6am Tae Bo workouts…well, that was our intention, anyways!! Our first business endeavor together was to start a (short lived) home decorating business “Inside Out Interiors” (with nifty business cards self-made on Publisher!) It really only lasted through our first 2 projects, one of which was our hairdresser’s salon (picture Steel Magnolias here) who let us do a weekend transformation of her entire salon! (This was even Pre-HG TV days!) Our husbands were troopers and painted with us all weekend! It was definitely worth it is as we were compensated with free foil jobs for a full year (definitely better than cash!) Our second (and I think final) job was for our dear friend Carolyn who gave us free reign in her kitchen re-do. Thankfully her kitchen underwent a second remodel in 2013 and was freed of the lovely “Roosters on French Chairs” border that we had so thoughtfully selected at Lowe’s! While we didn’t pick up any more clients, those two jobs provided us a space to learn to work together, appreciate each other’s strengths, tolerate each other’s weaknesses and learn to communicate well! We now see how that time was critical in forming a deeper, trusting friendship. DO you note the pattern here though?? MASK Social Group, Short lived Tae Bo workouts, Interior Design Business…we are great at coming up with ideas and STARTING….oh but it’s the FINISHING…not so much our strength! Sooooo….fast forward about 8 years. At this point we had 5 kids between us and a little different perspective. Caught in the daily tasks of mere survival with young kiddos our “mom-trepreneurial” spirits had been put on the backburner. Until one day while Lisa was observing her 4 year old daughter recite the Presidents from her plastic Wal-Mart placemat, she had an idea!! If my kids can learn the presidents from a placemat, surely they can learn more important SPIRITUAL things too!” We had both been struggling with fitting in meaningful conversations and more often than not “planned family devos” didn’t ever seem to go as planned!! Our kids were still young enough that they were still sitting at the kitchen table for meals, coloring or play dough a couple of times a day. We instantly saw this as an opportunity from the Lord to resurrect our creative gifts and combine them with God’s Word and our desire to teach it to our kids. Not being the “Develop a Business Plan” types we really hadn’t thought much about where the Lord would take us. We just knew we had a product that we believed in and wanted to share. We had an Aggie friend create a super simple blog and shopping site for us and we signed up for a few Jr. League Christmas shows and things took off. We were overwhelmed at the response and humbled that the Lord was blessing our efforts. We continually thank Him for his kindness to give us an opportunity to use the gifts He has given us to spread His Word in such a fun way! While we have received much affirmation from the parents and families who have purchased and used our placemats, the Lord has also given us some unique missional opportunities: donating mats to be used in orphanages in Africa, inner city ministry, pregnancy outreach centers and various churches. Each time we visit the post office and ship out our mats we pray for the recipients and are humbled that we so literally get to SEND OUT God’s Word. It has been 5 years and we are still in operation (It’s a miracle!) While business is steady it isn’t as booming as it could be given the facts that we now have 7 kids ages 1-14 between us, travelling husbands, and a lack of marketing and social media savvy. (We JUST got Instagram a couple of months ago!) #alittlelatetothegame 🙂 We continue to be content with the Lord’s blessings and HIS timing of growing our business. Most recently He has showed us that His plans for Tabletop Truths are even greater than ours. He has provided us with the gift of our first “employee.” She is a dear family friend (who Sara also had the privilege of teaching in the 5th and 6th grade.) Our precious Emily is 25 and has Autism. Her strengths and skills are a perfect match for our placemat making assembly line and she is delightful to spend time with! Mornings spent with the 3 of us laminating, singing Taylor Swift and drinking coffee are truly a JOY! We are excited to see if the Lord opens up future opportunities to employ/reach out to other friends with disabilities. Our time spent building Tabletop Truths has been integral in our friendship and our walks with the Lord. We have contemplated deep spiritual questions and solved many of the world’s problems during evenings crafting new designs and in the many hours we have spent hunched over a laminator! (Sometimes we wonder if we are going to get cancer or a rare disease from inhaling melted plastic while we laminate…but hey, it’s for the Gospel, right!?!) God has showed us his faithfulness each and every step of the way. We pray that we will always take seriously the privilege and gift of sharing God’s Word with others! Attributes of God…now and through the Fall! Sorry for the tardiness of our August post…the last in a 3-part series emphasizing one of our placemats each month of Summer! We hope you have enjoyed learning about the Armor of God and the names of Jesus in June and July. Please do share with us any little victories you or your kiddos had while working on these concepts. We love REAL stories! Well, now it’s August and a mixture of emotions with summer nearing its end is upon us….sadness for the cessation of “carefree-ness”, staying in PJs, lazy days at the pool and counting swimming as “bathing”…and yet THRILLED for the institution of routine, order, and predictability that we as moms and even our children (though they might not admit) CRAVE! School supply shopping, new backpacks and tennis shoes, and signing up for extra curricular activities fill our August “TO DO” lists…all while trying to squeeze in that last summer playdate, one more weekend beach trip, and a few more visits to the snow cone stand. Sooooo…..maybe this month wasn’t the best to pick to study ALL of the Attributes of God. But, no worries…its a great time to START them! 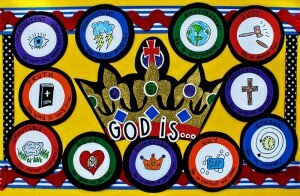 The Attributes of God mat was the first placemat we made and we really believe that learning these truths about God’s character are foundational to our kid’s spiritual growth. If they KNOW that God is sovereign, they can rest in his plan. If they KNOW that God is OMNIPRESENT they understand He is always with them. If they KNOW He is JUST they can relax when things aren’t “fair.” And the list goes on… Understanding the essence of God will give our kids a new set of lenses through which to see God and How he interacts with the world. What if you take the next several months and choose an attribute each week to focus on? First, drill your kids learn the word and the picture/visual that goes with it so they will have it stored away in their memory. Suggestions: Have your kids draw larger versions of each symbol on typing paper and hang them in common areas around the house. Make a memory game with the symbols and when they get a match they have to yell out that attribute. Have them make up a hand motion/movement to remind them of each attribute. Next, make sure they understand what exactly those big attribute words mean! 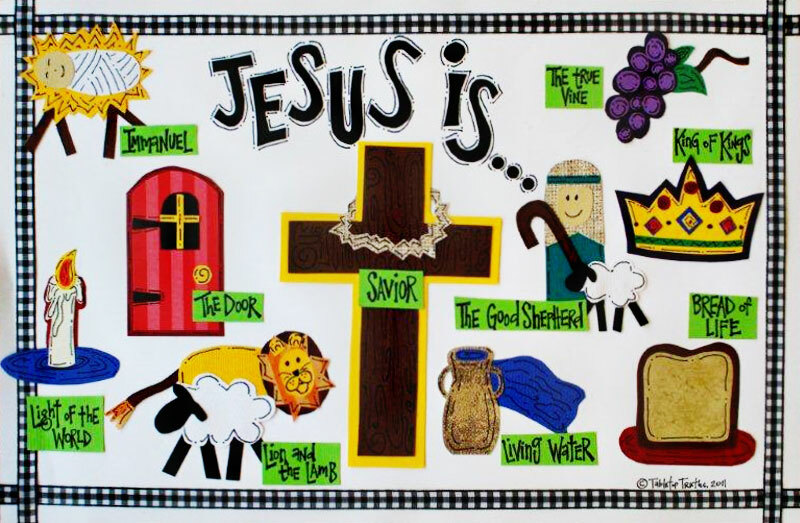 Yes, 5 year olds can learn “omnipotent!” Suggestions: Talk about certain situations that they have seen each attribute of God at work or when they have had to trust God based on one of his attributes. 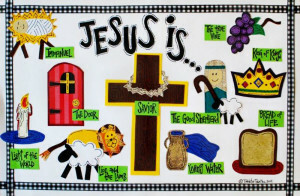 Reference different Bible stories that illustrate a specific attribute. (God showed his OMNIPOTENCE when he calmed the storm.) Every time you introduce a new attribute, review the one(s) from the previous week. Repetition is the key! There are some great resources out there to enhance teaching these attributes. I thought this one had some fantastic ideas and object lessons. So, yes, August is crazy…but what are you waiting for? Grab one more popsicle with your kids and make a plan to tackle all of the attributes in the next couple of months. What a wonderful tool to put in their belts! Blessings to each of you and yours as you enjoy the last days of summer. Okay, so summer is here and we want to help you have some intentional time with your kids! 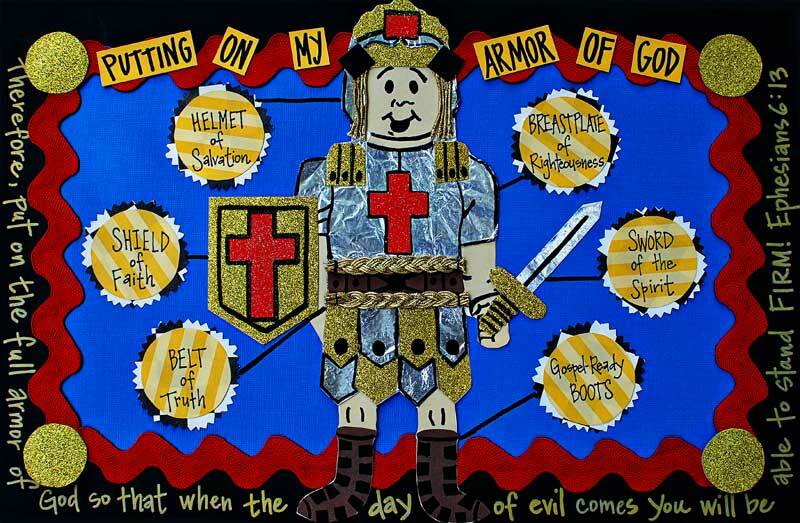 Let’s focus on the ARMOR OF GOD this month! 1. 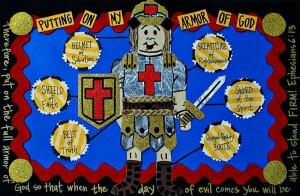 Use the “Armor of God” placemat daily for the month of June to keep the truth in front of them. Choose one piece a day (or every few days) to talk about. Ex: Today is “Sword of the Spirit Day.” Discuss all of the different times during that day that you can/should use that particular piece of armor. What happens if you don’t put on that piece of armor? Each new day (or every few days), choose a new piece and review the pieces you have already learned. Keep the dialogue going throughout the day. 3. Here is a great object lesson that shows the importance of “putting on our armor. ” It’s super easy to do and the message will stick with your kiddos for a long time! Here is the link: Armor of God Orange object lesson. Thankfully, we live in the world of Pinterest and Googling and with a quick search we can pull up activities, color sheets and more to use as teaching tools. But don’t get overwhelmed! The thing we want to reitterate though is that CONSISITENCY is better than COMPLEXITY. Go over the Armor Placemat EVERY DAY this month. Cover up the labels of each piece with your hand or with a post it note and see if your kids have memorized them. You will be amazed how quickly they pick them up! Over at our house we are going to have a little contest to see who can memorize the armor and the function of each piece first. A bowling date, banana split at Dairy Queen or even $5.00 goes a long way around here! So we have 28 days left in June…so if you focus on a new piece every 4 days your kiddos can master them! This is a wild and crazy world our children are growing up in but if we can help ARM them with these TRUTHS they will be ready and equipped to face any challenges that come their way. We will be praying for your families this month as you help your little soldiers ARMOR UP! 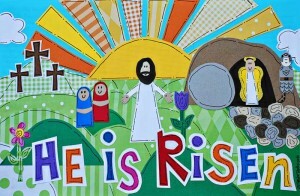 Yes, my kids can recite “He is Risen” and “He rose on the 3rd day according to the scriptures” but do they really get it? Do they really understand that the Christmas story that we give so much time to isn’t complete without the grand finale at Easter? It is because of EASTER that we have HOPE! This year my desire is that over the next 10 days (crud, I’m already behind on the eggs!) that my family and each of yours can take time and RELISH in the TRUTHS that the Easter account gives us. We are praying for meaningful conversations and contemplative moments for your families as you dwell on THE STORY that changed everything. 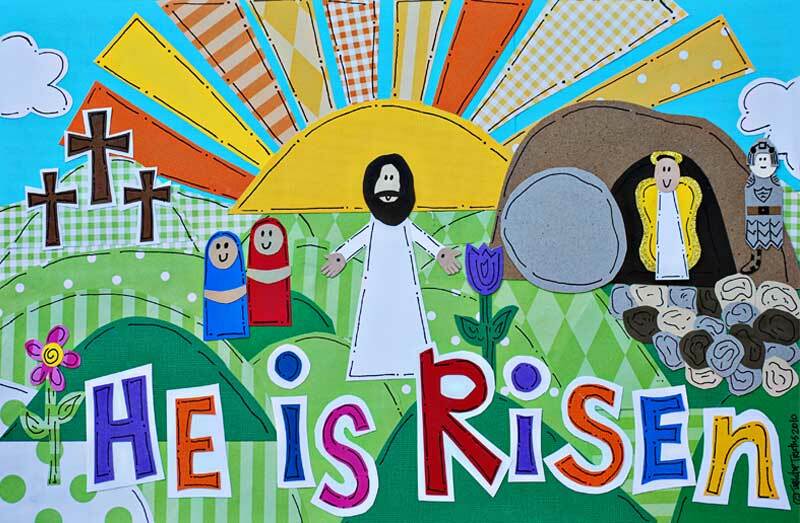 Oh, and enter EASTER SALE in the promo code and get Easter placemats for $6.00 each….a fun addition to your “kid’s table” or great, meaningful Easter basket stuffers…they will encourage “year round” conversations about the Easter Story! Stay in touch with Tabletop Truths! One of our goals for 2014 is to keep in better touch with our customers! We want to be able to alert you of specials, give you tips of how to best use your placemats and give you a heads up when we have new products. Will you please take the time to sign up for our email newsletter on our home page. WE PROMISE we will not flood your inbox with daily emails… (we aren’t that consistent..hahaha!) Anyone that signs up on our newsletter list (and those that already have) by Feb. 28 will receive a 15% off your entire order code via email. So please, share with your friends…anyone is eligible! Hope everyone’s year is off to a great start. Don’t forget to SHOW THE LOVE with our “Love/ Valentine’s Day mats” with those kiddos and families in your life! Order today and we’ll ship ’em right out! After your tummies are full from feasting and you are curled up on the couch sipping coffee and browsing online, come on over to Tabletop Truths and buy some placemats for the kiddos and families on your list! 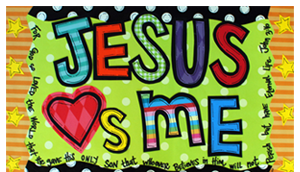 Give a fun, unique gift that communicates the TRUTHS of God’s Word in a colorful, catchy way! Use TURKEY15 to get 15% off your total purchase. Good until December 2! We are THANKFUL for all of our faithful customers and supportive friends and family…Happy Thanksgivng!! We are so excited to be up and going with our new website! Little Fish Web Design did a great job and we are so pleased! If you went to our old site you should have been directed here! With our new site we are excited to be able to offer special promotions and discount codes. Be on the lookout for specials throughout this Holiday Season! Thanks so much for your continued support!